The Scope Management Plan is part of the project management plan. It specifies how the project scope will be defined, developed, monitored, controlled, and validated. In addition, the Scope Management Plan may provide direction on the elements that should be contained in a WBS Dictionary and how the scope and requirements management plans interact. Scope Statement development: Describe how the Scope Statement will be developed including any alternatives analysis, stakeholder interviews, or research that will be conducted. WBS structure: Describe the WBS structure and whether it will be arranged using phases, geography, major deliverables, or some other way. The guidelines for establishing control accounts and work packages may also be documented in this section. WBS Dictionary: Identify the fields that will be used in the WBS Dictionary and the level of detail needed. 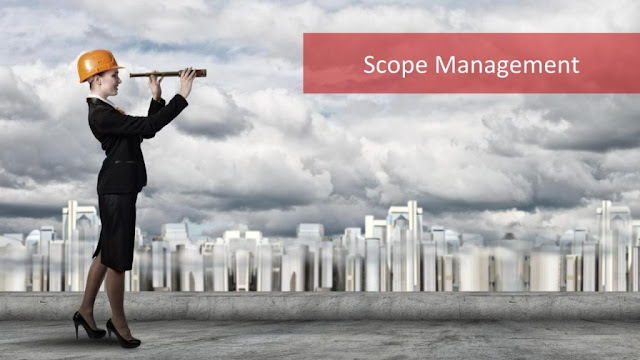 Scope baseline maintenance: Identify the types of scope changes that will need to go through the formal change control process and how the scope baseline will be maintained. Scope change: Describe how changes to scope will be managed. This includes articulating the difference between a scope change and a scope revision. Deliverable acceptance: For each deliverable identify how the deliverable will be validated for customer acceptance, including any tests or documentation needed for signoff. Scope and requirements integration: Describe how the project and product requirements will be addressed in the Project Scope Statement and WBS. Identify the integration points and how requirements and scope validation will take place.